King of England between 1509 - 1547. Henry left the running of the country to his ministers. His chief minister was Thomas Wolsey from 1514 to 1529. Henry was left to enjoy his sports and music. His hobbies were studying the Christian faith, he even wrote a book that complained about Martin Luther saying bad things about the Catholic Church. The Pope rewarded him by giving him the title 'Defender of the Faith'. Henry spent a lot of money on building an army and a navy. He wanted a son so that there would be a strong king to follow him. He married his first wife Catherine of Aragon in 1509, but she did not have any sons. Catherine had a daughter Mary. Henry wanted to divorce her to marry again. Thomas Wolsey had to arrange with the divorce with the Pope in Rome. Wolsey failed and was replaced by Thomas More. More thought the king was wrong to divorce so he resigned. Thomas Cromwell then became chief minister. Cromwell arranged for Henry to become head of the English Church (The Protestants). Henry broke with the Catholic Church in Rome. 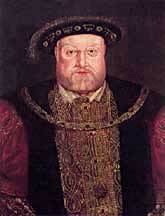 He divorced Catherine and married Anne Boleyn in 1533. Ann had a daughter Elizabeth, but she was not loyal to Henry and she was executed. 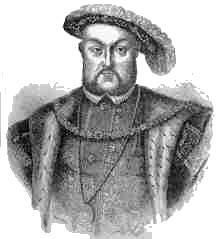 In 1536 Henry married Jane Seymour. Jane had a son Edward, but sadly Jane died. Anne of Cleves was Henry's next wife in 1540. He had never met her and when they were married he found he didn't like her. They were divorced after six months. Catherine Howard married Henry in July 1540 but she too was found guilty of treason and executed. Catherine Parr became Henry's last wife in 1543. Thomas Cromwell surveyed 800 monasteries and found that they had lots of land and wealth. Priests were thought to be rich, lazy and greedy. Between 1536 and 1539, Henry and parliament dissolved the monasteries and took their land and money. He used the money to pay for his wars with France. This period was called the reformation because they tried to reform the Catholic Church. When this failed Protestant Churches were being set up. Protestants wanted the churches to be well organised and make the services simpler. Henry was still a Catholic but would not obey the Pope. 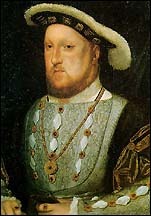 The Catholics held a peaceful protest, but Henry had 200 of their leaders executed in 1536. 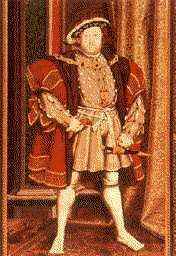 In 1544 Henry was in bad health. He was so fat he could hardly walk and had to be carried in a special chair. His lungs were blocked and he had leg ulcers. He was in a lot of pain and had fevers.